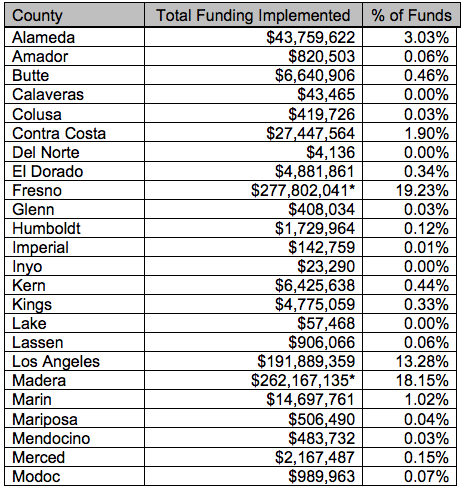 The report shares charts summarizing funding breakdowns by region, by MPO and by County. Charts showing breakdowns by region and by County are copied below. For more information, view the document in full here. Additional information provided by ARB is below. 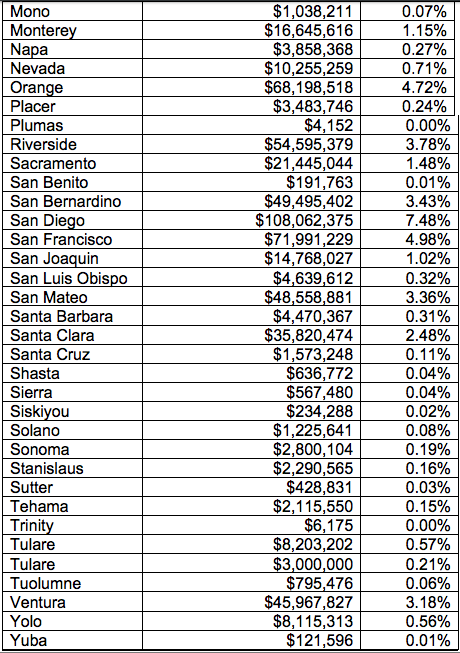 Each year the Department of Finance (Finance) is required to submit an annual report to the Legislature on the status and outcomes of California Climate Investments. In March, Finance released the 2016 Annual Report, which describes the status of funded programs and lists the projects funded. It also provides estimates of the GHG reductions expected from project investments and provides key statistics on benefits to disadvantaged communities, demand for funding, and leveraging. Assembly Bill 32, the California Global Warming Solutions Act of 2006 (AB 32; Nunez, Chapter 488, Statutes of 2006) is a comprehensive, multi-year program to reduce greenhouse gas emissions in California. The Air Resources Board has adopted a Scoping Plan and, together with other State and local agencies, has developed and implemented numerous regulations and programs, including the Cap-and-Trade Program to reduce emissions to meet AB 32 goals.